The original founder of the Astor fortune was John Jacob Astor (1763-1884). John Jacob Astor was born in Walldorf, Duchy of Baden (Germany) from a Jewish bloodline. The Jewish origins have been hidden, and quite a number of various ideas of the Astor’s heritage have been put into circulation by the Astors. John Jacob Astor was a butcher in Walldorf. In 1784, he came to America after a stop over in London, England. Although the story is that he came to America penniless--and that may be true--he soon joined the Masonic Lodge, and within 2-3 years had become the Master of the Holland Lodge No. 8 in N.Y. City. (This Holland Lodge is a prominent lodge in that many of its members have good connections to the Illuminati elite. An example of just one Lodge #8 member is Archibald Russell, 1811 - 1871, whose father was President of a real hotbed of Illuminati action for many years: The Royal Society of Edinburgh). By 1788, Astor was a master of masonic lodge#8. This is rather interesting considering Astor could not speak Englishwhen he arrived in America, and supposedly was very poor. John Jacob Astor was always very famous for being coldhearted, anti-social, “a man who didn’t have charm, wit or grace.” (This quote comes even from a relative of the DuPont family who wrote a sympathetic Biography entitled The Astor Family.) If this man lacked social graces and was so cold, and was so poor during his first years in the U.S., why did he rise to such prominence in Freemasonry? Certainly not because of his social graces. For instance, one time later in life at a meal given for elites, when his hands got dirty at the table he reached over and used the shirt of the man beside him to wipe his hands. The original financial break came by carrying out a series of shady and crooked real estate deals in the N.Y. city area. The next breakcame when two men who are now known to have been in the Illuminati gave John Jacob Astor a special government privilege. The two men were Pres. Jefferson and Secretary Gallatin--both Illuminati members. The United States government had placed an embargo on all U.S. ships from sailing with goods in 1807. But Astor got special permission from these two men for his ship to sail with its cargo. His ship sailed and made close to a $200,000 profit in that day’s money. Astor strangely profited greatly from the War of 1812, which crippled almost all the other American shippers. Astor also worked together with George Clinton, another member of the Illuminati, on land deals. Even at that period in history, British intelligence worked for the Committee of 300 and for the Thirteen Top Families, it is interesting then, that John Coleman who had access as an intelligence agent to secret documents, discovered that the original John Jacob Astor was also a British secret agent. The Thirteen Families have very intimate roles with the American and British intelligence cults. Prior to 1817, John Jacob Astorentered into the fur trade and remained the biggest player in the fur tradeuntil he got out of it in 1834. Over the years, he had managed to build up a monopoly. How he managed to push everyone else out is a good question. Bear in mind, white people had been trapping furs in the New World for several centuries, and the Indians for who knows how long. Then this guy Astor comes along and in a few years totally owns the whole industry! Again this could only have happened, because the occult power of this Astor family gave them the right. Obviously, others in the Committee of 300 had to step aside, if his position in the hierarchy had not given Astor the right, believe me the other families that originally controlled the fur trade would have gotten rid of Astor. One result of his fur company, was that Astoria, OR was created. Today, perhaps in honor of the family that originally took interest in it, Astoria is a real hot-bed for the secret Satanic covens in Oregon. John Jacob Astor did have a few helpful connections. Three of his relatives were captains on clipper ships. He had connections in London to the Backhouse family. He married a Todd, a family frequently associated with Satanism. His wife, a Todd, was also connected to the influential Brevoort family. And finally for some reason, John Jacob Astor was also on good relations with the politicians of the day, perhaps because most of them were Freemasons too. For a few years John Jacob Astor had participated in the opium trade, but in 1818-he publicly quit running opium to China. John Coleman in his good book The Conspirator’s Hierarchy: The Story of the Committee of 300, p. 131 notes, “John Jacob Astor made a hugh fortune out of the China opium trade .... it was the Committee of 300 who chose who would be allowed to participate in the fabulously lucrative China opium trade, through its monopolistic BEIC, and the beneficiaries of their largess remained forever wedded to the Committee of 300.” Interestingly another Top 13 family, the Russells, was also one of the lucky ones to get a slice of the China opium trade. It is clear repeatedly from history that Astor was privy to inside information in the government, and maintained his own courier system. John Jacob Astor bought up large amounts of land in NY which land greatly increased in value. The Financial Panic of 1837 allowed him to foreclose on a large number of mortgages. John Jacob Astor’s wealth continued to skyrocket. As one biography said, “When it came to a question of principle versus profit, Astor was a practical man.” Put simply, he had no scruples. Astor had a reputation for being a ruthless landlord. He also had the reputation of not paying his legitimate debts. Astor became a banker, and sat on the board of 5 directors of the new national bank that Hamilton created for the U.S. government called the Bank of the United States. Astor owned a large block of the stock of the Bank of the United States. Astor also was fairly active during his life as a Freemason, holding several more key positions in the secret lodge life. John Jacob was the richest man in the United States. Note this reference. Meyers, Gustavus. History of the Great American Fortunes. London: Stationers Hall, 1909, p. 147 said, “Statistics issued in 1844 of manufacturers in the United States showed a total gross amount of $307,196,844 invested. Astor’s wealth, then, was one-fifteenth of the whole amount invested throughout the territory of the United States...” Is having 1/15th of all of what American money is invested not rich? John Jacob Astor’s descendents had a penchant for secrecy, and set up things to rule from behind the scenes. In contrast, to some of the other top families, the Astors perferred not to sit on boards of corporations they controlled. In 1890, a real estate expert calculated the Astors owned 1/20 of New York City real estate. After making their fortune while residing in the New York area, the Astors by and large have all gone to England. They still wield great financial power in the United States through proxies. Forum Magazine, Nov. 1889, commented that authorities estimated the Astors were worth $300,000, but that that figure had to be an underestimate. Just like the Rothschilds, DuPonts, and Rockefellers, the Astors always set one of their Astor males as the head of the entire family. This headship is passed down as a birthright within the different branches of the family, just as any King passes on his throne. On the corner of 33rd St. and 5th Ave. (the site later began the site of the Empire State Building) the original Waldorf-Astoria Hotel was built by William Waldorf, et. al. The hotel opened in Mar. 1893. It is described as ‘the ultimate in snob appeal.’ Later two Astor cousins built the Astoria (another even taller elite Hotel) in New York which opened in 1897. Of course, like many of the other elite famIlies, the Astors have theIr Maine property to get away and relax. In 1894, John Jacob wrote a novel A Journey in Other Worlds where he describes a society which operates on the idea of conserving energy. Strange how the elite likes to promote conservation among us ‘cattle.’ In the late 1800’s, the Illuminati began to reconfigure its outward face. The higher levels started creating innocent sounding cover organizations to hide their meetings behind. In 1901, the Astors contributed toward the creation of the Pilgrim Society, which was the cover organization for Amer. & Brit. 6° Princes of the Illuminati. I believe at least five Astors are now members of the Pilgrim Society. The Pilgrims had recently included David Astor, John Jacob Astor 8th, and William Waldorf Astor 3rd. And during the 1970s, Baron Astor of Hever was the President of the London branch of the Pilgrims. This implies that Astor of Hever was at least the next level up in the chain of command. The Astors also have been veryprominent in the Group’ which is Britian’s equivalent to the Skull & BonesSoc. In Britain, the Astor, along with about 20 other families dominate the Group, just as certain families like the Whitneys in the U.S. help dominate the Order of Skull & Bones. Again, as was earlier pointed out, the key to understanding Satanism is the bloodlines. In 1910, the muscle and bone branches of the Illuminati reconfigured themselves with the creation of the Round Table groups in 1910. The Astors were the part of the financial backers behind the Round Table groups along with Abe Bailey. Rhodes and Milner were key players is setting up The Society of the Elect, a supersecret top circle of Illuminati. Rhodes Trust in part helped by the Astor, helps finance the Rhodes Scholarship system. Rhodes a high ranking Freemason wanted the Masonic clap-trap as part of these various new groups, but Milner and Brett did away with the Masonic rituals and costumes, etc. but Milner and Brett did away with the Masonic rituals and costumes, etc. In 1919, the Royal Institute of International Affairs (RIIA) was created. And the Astors were the major financial backers of the RIIA which functions as the 4° cover of the Illuminati. For those who are new to this, the RIIA is the British equivalent to the Council on Foreign Relations (CFR) which takes a major role in the policy making process in the U.S. Waldorf Astoria was appointed to the RIIA. Just above the CFR/RIIA are round table groups which were initially named by Cecil Rhodes as the “Association of Helpers”. Cecil Rhodes set up the Rhodes Scholarships to recruit and bring top men from several nations to Oxford to be initiated into the Illuminati and to learn about how to bring in a One-World-Government, So the initial selection into the Rhodes program--ist degree of the Illum.- is equivalent to the initiation into the Skull & Bones. In the picture you see how the Cliveden Astors were intimately connected to the Rhodes Scholars. Rhodes Scholars frequently went to the Cliveden Estate. By looking at the genealogy chart you can see how the family in London broke up into two powerful segments. One part centered around the Cleveden Estate. Another group became Barons-the Astors of Hever - or the Hever Astors for short. William Waldorf Astor owned the Pall Pall Mall Gazette, the Observer, and the Pall Mall Magazine. The London Times was largely controlled by the Astors, and since 1922 they have owned this major source of British news. The DuPonts and the Rockefellers also have some major businesses where they too own blatant large holdings. However, most of the wealth of the 13 Top families is hidden so that the ties to who owns it are difficult to track. Hoyt Ammidon has been a proxy for Vincent Astor and the other Astors. (See membership list of Illuminati in this newsletter). The Astor family also used Owen Lattimore as their proxy for opium trade, who in turn used Laura Spelman who was funded by the Institute for Pacific Relations (IPR). The lPR was the group that supervised the Illuminati’s decision to allow Red China to share in the Opium trade. The puppet strings behind big world events may not be seen by the public, but if we trace the origins of several big events we see the Astors helping pull strings. The IPR helped lay the groundwork for the Pearl Harbor attack. The Astors also were behind the appeasement policy in Europe which allowed Hitler to become a threat. The Astors were also involved in the temperence movement against alcoholic drink which was begun by the Women’s Christian Temperence Union. The temperence movement was an elite created movement just like today we have big issues like Aparteid which are made up by them to keep us busy. Joseph Kennedy and Onassis, two other top 13 Illuminati families got rich off of the temperence movement by bootlegging. So many people have exposed the temperence movement (See Occult Theocracy for just one expose of Freemasonry’s involvement) that it is not pertinent to cover it here. Today’s equivalent of the temperence movement is the drug war. 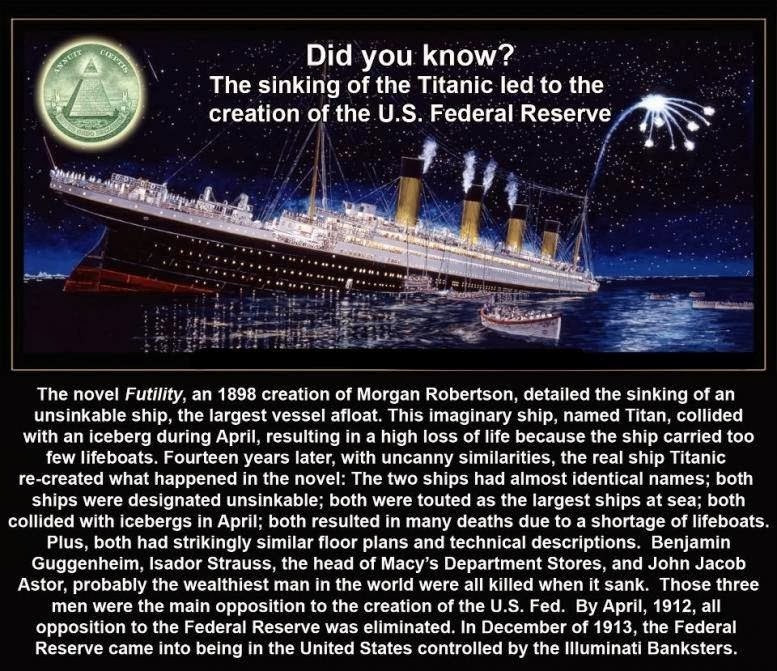 Col. Jack Astor, one of the world’s most powerful men, was among those who went down with the Titanic. To his honor, he didn’t have to sacrifice his life, but did. If he had been a scoundrel he could have chased a woman and her children from some lifeboat. Many sermons have been preached on the significance of the Titanic, and I personally am beginning to feel that God laid it on the hearts of so many of his ministers to understand that the Titanic was a judgment upon the pride of the world. More specifically it was a warning to the New World Order’s elite. Another Illuminati invention was Communism. This has been so thoroughly documented I don’t know why I have to state it here, except that there are still people who haven’t taken the time to study it out. James II. Billington’s book Fire In the Minds of Men - a very scholarly work, and Occult Theocracy are some good starting points to study this. The Fabian Society was also connected to the Illuminati. For instance, Illuminati prince Prof. George Edward Gordon Catlin, Pilgrim Soc. member was a member of the Fabian Society’s executive committee. The Fabian logo is a Wolf in Sheep’s clothing!! Fabians like H.G. Wells who wrote so eloquently on the New World Order with such books as The New World Order, A Modern Utopia, The Open Conspiracy Blue Prints For A World Revolution was a wolf in sheep clothing. H.G. Well’s made the New World Order something that sounded advantageous to everyone, a Utopia of sorts. That is not what it will be. During the 1930’s, the Fabian Socialists created the Political and Economic Planning group (PEP). Mason Viscount Waldorf Astoria was a leader of PEP. A confidential program that the PEP created and implemented through the British government was later described in a book Principles of Economic Planning in 1935. The book doesn’t explain why its cover has a ostentious Masonic square and compass displayed on its cover. George Berhard Shaw, who was a communist and Fabian Socialist was the best friend of Lady Nancy Astor, who became the first woman Member or Parliment. These two spend vast amounts of time together, much more than Nancy did with her husband Waldorf who she didn’t care to be around. Waldorf was the Mason that was mentioned earlier who helped lead PEP. After Nancy Astor was elected (or selected by the elite) to be the first lady MP, one of the Russell ladys soon afterwards also became an MP. Communism pretends it is the enemy of the rich capItalists, but both the rich elite and the communist leaders are committed to wipe out Christianity, to wipe out free trade with monopolies, and to set up an Illuminati One-World-Government. Do you see they have similar goals? A picture is included of Waldorf and Nancy Astor’s visit to Russia during the 1930s. The Astors were not treated like enemies but like royalty. Can we see how the elite controlled press have deceived us? Do not trust our Illuminati-controlled elite to protect us from communism, they control communism. Besides socialism, Nancy Astor was a big supporter of Christian Science. Christian Science was a front for witchcraft from Its very beginning. For more information on what Christian Science is about I suggest people study Be Wise As Serpents, chapter 2.6 ‘The Healing Light”. Nancy Astor wrote The Natural History of the Vampire and a book on the early Mason/Communist Bakunin. She used Grenfell family papers. The Grenfell family were close friends to the Cliveden Astors. David Astor, (The Honorable) attended Bilderberger meetings in 1957 and 1966. Alpha Lodge is the lodge in England that is traditionally for royalty. There are other elite lodges too, where the those of the elite, can protect themselves from rubbing shoulders with those of less social stature. These are the type of masonic lodges that the Astors Join. In summary, an examination of the Astor family reveals their close connections with the full spectrum of Illuminati activities ranging from Freemasonry, the Illuminati itself, the Pilgrim Society, the Round Tables, Communism, Fabian Socialism, CFR, RIIA. the Bilderbergers, as well as the various politically (that is Illuminati) tainted banks such as Chase Manhattan. Ava Alice Muriel Astor was an occultist. She was born in 1902, was pretty but also a very serious woman. She was a very strong willed person that was able to dominate a person in her presence unless they were also strong willed. She was into Egyptian magic and believed she was the reincarnation of an Egyptian princess and a disciple of Ikhnaton. Alice Astor may have been one of the first people to enter King Tut’s tomb, where she got herself a necklace. Aldous Huxley wrote Brave New World as a picture of things that were to come --most people think as a expose, but it was really more as a plan or blueprint Aldous Huxley and Alice did a great deal of occult things together. Their financial power is unchecked. Myers and others have noted the Astors are above the law. The Top 13 families don’t obey the law--they are the law. The Astors may have Illuminati Kings and Princes in their ranks, they may have dozens of billions of assets, yet it will all be nothing when they face their Creator at judgment. Thirteen families or bloodlines are at the top, and five of these families are the inside core of these thirteen. Prior to Be Wise As Serpents, the existence of thirteen top families was not known by very many people. The existence of the 13 families had come out in Berry Smith’s book Final Notice in the 1980s, but the names were still unknown. Berry Smith of Australia wrote in his book Final Notice p. 9, “There are 13 families or groups heading up the World Government plan. These families are portrayed as the 13 layers of blocks found on the strange seal on the reverse side of the U.S. $1 bill.” In a little read article, one SRA victim recently wrote that Satanism was controlled by a few families. Recently, one of the DuPonts was on a television show because the DuPonts were trying to kidnap him because they didn’t like his support for the book Dope. Inc. I was able to get a copy of the book, and was overjoyed to find such an excellent book. My sources have been telling me that the top Illuminati families were behind the drug trade. Yes, Satan’s top followers are also the kingpins in destroying humanity for profit through drug trafficking. The following families (besides others) or individuals from these families are mentioned in Dope Inc. as involved in some aspect of the drug trade: the Astors, Bundys, DuPonts, Freemans, Kennedy’s, Li’s, Rockefellers, Rothschilds, and Russells. It is no coincidence that nine of the Top 13 families would get there names in a book which revealed the big names behind the world’s illegal narcotics trade. It should be mentioned that some other prominent Illuminati families also play key roles in the drug trade such as the Bronfmans, Cabots, Shaws, Bacons, Perkins, Morgan, Forbes, Cisneros and Oppenheimers. Where have we seen such names before? There are names in Dope Inc. that people would do well to know the danger of such as Louis Mortimer Bloomfield, Robert Vesco, Francois Genoud of Switzerland, Ivan Slavkov of Bulgaria, the Duke of Kent - Master of the Grand Mother Lodge of the Scottish Rite, and Jardine Matheson to mention a few. All our favorite secret fraternal groups appear in Dope, Inc. too. For instance, the Triads, P2 Masonry, regular Freemasonry, the CIA, the Order of St. John, and the Jesuits. The Universal Christian Gnostic Church’s which practices black magic has a whole chapter showing its connection to the drug trade. Britain’s assassination bureau Permindex which has been mentioned previously in this newsletter also gets a chapter in the book. In the Be Wise As Serpents book, I examine in detail only the Rothschilds and the Russells. I did not present much to back up my statements about the 13 families. Further, One of the unthinkable items that most people do not want to consider is that their leaders who they have idolized may be utterly corrupt. There was nothing to do but sit down and give the nitty-gritty details if the threat from the Illuminati was to be properly understood. The facts would speak for themselves. The ideal solution for both writer and reader was for me to write up my research and for you to read it as a series of articles. There is only so much a person can assimilate at once, and these articles give lots of details. In January of this year I began a series of articles on the top 13 families - families which the top experts said nobody knew about. I did this with the hope of stimulating others to notice these families, and to alert a wider sector of the Body of Christ. The young colleague David J. Smith, who wrote part of the Jan. 1 article on the Illuminati, was led to carry out further research in addition to what the Jan. 1 article had. Most of this article’s information on the Astors then is a result of David’s research. Most of the material put out on the Astors shows the unmistakable mark of distortion by writers and historians giving information in line with what the Astors wanted the public to get. Books on the Astors contain both believable and unbelievable material, fact and fiction, Some of the real facts may remain obscured forever, but that has not stopped us from getting the most accurate picture we could reconstruct. The Astors do not make the task of investigating them easy. They have been very secret and very deceptive since they arrived In this nation. John Jacob Astor, the first prominent Astor was a notorious liar, “he was known on occasion to invent romantic tales for the edification of people who annoyed hIm with questions ...... Men who knew him best were, therefore, neither ready to discredit completely all legends about his exploits nor to repeat them as gospel. The truth, they suspected, lay somewhere between the two extremes.” (Terrell, John Upton. Furs by Astor., p. 102.) John Jacob’s son insured that his father’s lies would go unchallenged by incinerating all of his personal records, business records and other papers. The Astors have come up with various origins for themselves and those for or against the family have added more ideas. One strong possibility is that the Astors are descendants of the Astorga family found in Southern Italy before the 1600s. The most likely meaning of the name is that both Astorga and Astor are variations meaning “Astarte” who is the mother of the occult. Her name is also Semiramis. In Babylon the trinity was Nimrod (the sun), Semiramis (the moon), and Tammuz (the morning star). In Egypt, these gods were called Osiris, Isis, and Horus. The pictures and statues Isis and Horns were renamed by the Roman Catholic church as the Virgin Mary and the Christ-child. The family may have moved from Savoy to Walldorf, Germany. Although it is not a certainty, the best explanation from the available clues indicates that Walldorf’s coven had some important personages in the witchcraft/satanic system and that Johann Astor’s family had power. At that time in Europe, the Astor family had no chance to turn their occult power into success. The power and class structure In Europe was rigid and gridlocked. The boundaries between peasant and aristocracy were solidly in place. So the family looked to the New World to transmute their position in the Satanic hierarchy into financial wealth and power. Johann Astor In Walldorf was only a butcher. His best son John Jacob (1763-1848) was selected to establIsh the House of Astor in America. The process of 400 years looks like this. Various Satanic families moved into the Southwest German area in the late Medieval time period. Witchcraft associated with Diana was practiced In Southwest Germany, and this began to alarm various elements of the Roman Catholic church. The Astor family provides leadership in the covens in the Heidelberg area. Witchcraft spread virtually all over Southwest Germany. An examination of the old records from about 1500 to 1650 show that witchcraft was being practiced throughout the area. (I have the names of over 120 towns were it was practiced in SW Germany, the list derived from old German records.) The Astors did not have the position, wealth, and power that accorded their position in the late 1700s of occult leadership. In Germany, England and France there was no way to climb the social ladder. However, the New World presented opportunities. The Astors sent two sons to prepare the way for John Jacob, one to England, one to America, and then sent John Jacob their most promising brightest son to the New World. While in America the Astor family helped the Satanic elite headquartered in England to maintain its control over America. Having come from Germany, and also due to Satanism being secret, John Jacob Astor’s help given to pro-British-elite moves were more difficult to suspect. After establishing themselves as aristocrats in America, the tribe of Astors moved to England, where because of their high social position in America, no one questioned the Queen bestowing titles of nobility on them. All along the process, people with Illuminati connections opened doors for the Astors. At this point, it needs to be pointed out that there were ties between the following groups: English royalty, English Satanism, English Freemasonry, and German witchcraft, and the Italian Black nobility. (Taking the liberty I have as author of this article, I am going to digress to give some examples of these connections. Although on the surface this doesn’t directly pertain to the Astors, it does.) When one paints in the bigger panorama of what was happening in the occult world, and then one sees a blazing star streak across that panorama, then the real history of that blazing star is given by tracking its voyage through that panorama. However, the history books have intentionally hidden the significance of so many of the players and groups that lay along the track of that blazing streak. Order of the Knights of the Helmet--This was an illuminated secret society with Sir Francis Bacon at its head. In order to hide its Masonic rituals, Sir Francis Bacon wrote a play entitled “The Order of the Helmet.” This was performed in 3 Jan. 1594, and again for twelve days in December 1594. In Dec. 1594, brItIsh Aristocrats who had been demonically illuminated, met and put on a “play.” Calling their initiation ceremony a play was a great cover. Sir Francis Bacon was made king and “prince of purple.” Various men were invested with the Collar of Knighthood of the Helmet, and took vows, And a “Series of Charges by six High Councilors” was given in a manner that is very similar to what the satanic S.R.I.A. does now. The reader may ask what does this have to do with the Astors? This is simply a few brief look at the background of what was happening in the occult in Europe. The Queen of England sent Sir Francis Bacon as a young man in his twenties to the continent of Europe. Sir Francis Bacon toured France in places such as Louvre, St. Cloud, Blois, Paris, and Poictiers, He also travelled to Germany, Italy and Spain. He visited the various royal courts, such as the court of Marguerite de Valois. Marguerite was married to King Henry of Navarre. Her mother was the evil Catherine de Medicis. Sir Francis Bacon also met with many secret societies. At Marguerite’s court he spent time with “The Pleiade” fraternity, which was a group of 7 intellectuals. Hell Fire Club -- This was a secret Satanic cult which was associated wIth early Freemasonry. When the connections became known between the Satanists of the Hell Fire Club and the elite of Freemasonry, Freemasonry and the elite made some radical moves. First, Freemasonry publicly proclaimed that it had nothing to do with the Hell Fire Club. rhen the Hell Fire Club was publicly disbanded by the government (acting on orders from people that tied-in with the club). Later, quietly the club was reconstituted. Phillip, 1 at Duke of Wharton (1698-1731) who was the second person of nobility to be Grand Master of England’s Freemasons (G.M. of the Grand Lodge 6/1722-11/25/1723) was president of the Hell Fire Club. He was an M.P, in the House of Lords. In 1726, he left England and was a basically brought into ill-repute by the Masons, who distanced themselves from him. George Lee, Earl of Lichfield was also another prominent Mason who was a member of the Hell Fire Club. Benjamin Franklin, who was the head of the American Freemasons in various capacities, and also the head of the Rosicrucians and a number of other secret occult groups was also a member of the Hell Fire Club. Benjamin Franklin’s satanism was not mentioned in my Be Wise As Serpents book, but he was an important Satanist who was part of the Order of the Quest--that is the group which has been entrusted with the plans for bringing in the New World Order of Satan. Remember that John Jacob Aster was very involved with Freemasonry, as were a number of his intimate friends such as N.Y. Governor DeWitt Clinton and General John A. Armstrong. In regards to the Hell Fire Club, the Earl of Sandwich, Benjamin Franklin and Sir Francis Dashwood were leaders in the Hell Fire Club and were also Post-Master Generals of the British Postal Service, All were Freemasons too. Their positions as Post-Master Generals allowed them total access to the mail, and allowed them to spy on the communications of the 18th century. The man who became Post-Master General after Dashwood, who moved on to be a M.P, in the Br. Parliament, was the Mason John Wilkes. John Wilkes took over in 1766 (in 1774 was Lord Mayor of London). Wilkes then brought one of the original Hell Fire Club members, a friend of his Willis Hill to help with the Postal Service. The next Post-Master general was the totally corrupt man the Earl of Sandwich, who served until 1771. Benjamin Franklin spent the summers of 1772, 1773, and 1774 at Dashwood’s estate in West Wycombe. The caves under Dashwood’s estate at West Wycombe were used for satanic sexual rituals, which were participated in by Benjamin Franklin. Ordo Saturnus--This is an old secret satanic German order. In the last few newsletters, I have been educating people on the meaning of Saturn. It means Satan. This previous information helps us understand John Jacob Astor IV when he writes in his book A Journey in Other Worlds, “The souls of the righteous departed were found on Saturn, where, to a background of weird music, pulsating hearts, luminous brains and centers of spiritual activity quiver with motion.” (A side comment: John Jacob Astor IV had a reputation for his insatiable sexual lust to paw women.) One of the people we have to investigate in relation to the Ordo Saturnus is Valentine Jeune, who was John Jacob Astor’s mentor in Walldorf, Germany. Jeune may well have belonged to an organization such as Ordo Saturnus. John Jacob Astor arrived in England and may well have been introduced In England to British Intelligence by his brother George. At any rate, he got involved in British intelligence which has always been closely linked to Freemasonry and the elite. He spent time socially with the Backhouse family which an aristocratic family. How do you suppose such a supposedly destitute young man could be accepted so easily into the Backhouse social scene? This is not explained by modern biographers. After four years, his brother George then sent him to America to represent George’s music company. His brother Henry met him when he arrived in 1784 at age 20 and introduced him to the occult world in New York City. Thomas Backhouse & Co. was a leading house in the lucrative fur trade. John Jacob Astor set out to bring the fur trade under his own control. There is a tact that must be faced. the elite’s Committee of 300, a secret legislative group of the Illuminati, decided that John Jacob Astor could expand into the fur trade and into the opium narcotics trade. Dope, Inc. shows that the Astor famIly was the first American family to get into the Opium trade, and that their opIum trade had was a special privilege that most other American businesses did not even try to compete with. Why? Dope, Inc. doesn’t say this but I know that it is because the Committee of 300 decides such things, not free enterprise. American furs yielded 1000% profit in those days. The privilege of fur trading was a pot of gold so to speak that the Committee of 300 gave Astor, and it could only have happened because the Astor family in Walldorf was already part of a principal satanic bloodline. (The Illuminati members of the Astor family today use their influence to help those of the Illuminati in their dope trade.) William Backhouse the American representative of the London Backhouse family and John Jacob’s brother Henry were two of John Jacob initial contacts in the New World. Soon John Jacob had met all types of people involved in New York’s occult world. John Jacob married Sarah Todd. John Jacob’s step-mother Christina Barbara is described as “the perfect, cruel fairy tale stepmother.” John Jacob ‘raised the principle of self-interest to the level of a philosophy and ..... claimed for himself a natural superiority over his less able and less powerful fellow men, a sort of God-given right to exploit the world and its inhabitants for his personal gain, This was not mere cynicism, but a genuine belief that in some way [he was] among the chosen people for whose convenience and advancement lIfe was ordered ..... Such people ... make history, but they also pervert it in human terms because their world and the codes that govern it have nothing to do with morality.’ (Sinclair, David. Dynasty The Astors and Their Times. p. 59) ‘Astor took Freemasonry seriously... [Gov. DeWitt] Clinton rose unusually fast in the degrees, but the German Immigrant [John Jacob] who talked at times as if he had marbles in his mouth was not far behind him. Astor eventually caught up to Clinton...’ (Terrell. Furs by Astor, p. 84). This was the son of John Jacob Astor. He was infamous for his hank treatment of thousands of people who rented from him in New York. There were repealed riots by tenants who were opposed by the harsh filthy living conditions in the buildings Astor owned, but their complaints were consistently ignored by Astor and their riots suppressed by the police. Only half of the children of his tenants lived to age 20. The Astors were deeply involved with the Tammany organization. William B. supported the corrupt administration of the infamous New York mayor, Fernando Wood. The government at that time was a pack of corrupt men. When Wood was exposed, Astors involvement was overlooked. This is another example of Astor power. He was the son of William Backhouse Astor. He was just as haughty, just as cruel, and just as corrupt as his father and grandfather had been. He created “sweat shops” for the poor masses living in his New York tenements. He also supported corrupt politicians such as the criminal “Boss” Tweed who ran NYC. The Tweed Ring stole millions of dollars from the city of New York. Before they finally got caught and sent to prison Mayor Tweed and gang cost the city $200 million. Again John Jacob Astor III’s power allowed his involvement to be basically overlooked by the press, while Tweed went to prison for life. Most of the Astors took off for England, but one branch of the Astors that is clearly involved in Satanism and the occult is the Chanler family. The Chanler family have Astor blood via “Madie” Astor Ward. The Chanler’s parents died at an early age, and the Rokeby Estate in NY was given by the Astors so that a cousin Mary Marshall could raise the Chanler children. The Chanler family is one branch that clearly shows all the earmarks of the SatanIc hierarchy. The behavior of Robert Chanler, Elizabeth Chanler and Armstrong Chanler have ail the classic earmarks of having MPD, and having suffered SRA. The Rokeby mansion that the Chanler family lived in was a haunted house of the first rate. Fairies, ghosts, signs and potents, and all type of occult activity takes place at this mansion, When top rx-Illuminati members who have managed to escape Satanism describe their home life, they mention that occult phenomena was a natural part of home life. This certainly is what life has been lIke at the Chanler Rokeby mansion. The Chaniers are not well known publicly but have been part of the social scene of the elite. Theodore Roosevelt and Senator Henry Cabot Lodge (of the elite Cabot family) were good friends of the Chanlers. The Chanlers created the town Roanoke Rapids, North Carolina. (At some point I hope to do an expose on the resort area in that general area that is a “meat market” for the Illuminati. Families like the Bill Clinton’s go down there every year for vacation to mingle with other middle management families that the Illuminati use as lackeys. Illuminati “scouts” watch and choose who they want to use for political office, etc.) A Who’s Who of the Astor orphans--the Chanier family who are of interest to our study of the Illuminati will now be given. John Armstrong Chanler-married mystic novelist and morphine addict Amelie Rives. “Once wandering in the twilight she asked wistfully, “Do you think If I drank a whole cupful of warm, bubbly blood, I would see a real fairy” ... Then there had been the period during which she suffered anguish over the thought that Satan was banished from Paradise forever; she prayed with tears that ultimately he might be pardoned and readmitted to celestial bliss.” (Thomas, Lately. The Astor Orphans: A Pride of Lions p. 76.) John carried on spiritual experiments in what he termed “esoteric buddhism”. Due to his obsession with this practice and a business fight with his brothers they put him in an insane asylum. He finally did get released. One has to wonder what the whole story was behind the incarceration. HIs esoteric buddhism or “x-faculty” was a trance state where a spirit spoke or did automatic writing through him. His eye color would change when this spirit worked through him. · Franklin Hughes Delano--heir to a massive whale oil fortune. He married Lavia Astor, daughter of the original William Buckhouse Astor. · James Roosevelt Roosevelt-married Helen Astor, daughter of William Backhouse, Jr.